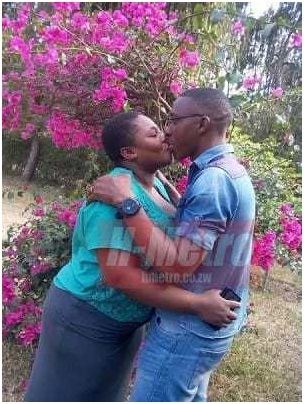 A secret love affair has been exposed after a husband discovered photos of her wife's “mpango wa kando” in the phone which he took to a repair shop. The man who come from Zimbabwe and identified as Moses Munesi on social media, uncovered his wife Chenai Mirairo Jeyacheya’s secret affair, in the worst way ever. According to reports, Moses had taken Chenai’s phone for repairs when he stumbled upon photos of his long term wife, sharing intimate hugs and kissing her lover identified as Charles Majongwe. According to Moses, his wife had forgotten to remove her memory card from the phone, and out of curiosity, he decided to go through her picture folder, where he discovered photos of his wife kissing Charles (a soldier) and hugging him intimately as well. He also went through her chats where he saw their love messages. “It was better for this soldier to stab my body for it heals than to leave my heart with a wound that will last a lifetime by cheating with my wife. I am a cross-border and I do not take more than a week to visit and come back but this gunman wrecked my marriage that I am prepared to approach the courts of law to help settle the matter. He was trained to be disciplined and has failed, he is married but is still shooting in other people’s ‘private land’.